I (Kaitlyn) recently came across a blog called Reflections of a Birth Mother. I would highly recommend exploring this blog. 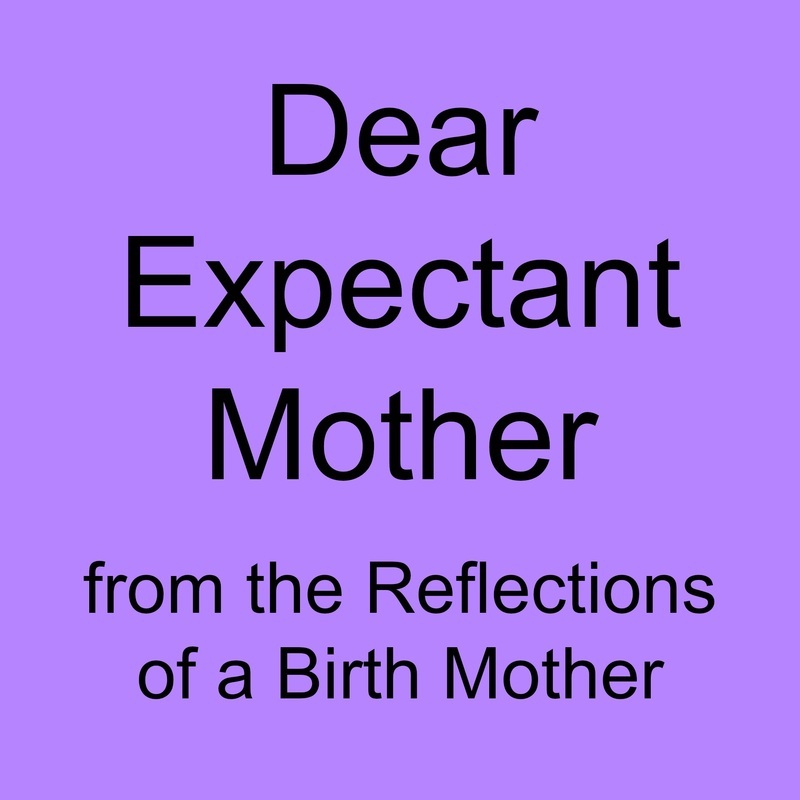 Brina, the author, is a birth mother and seems eager to use her experience to help others that may also be considering placing a baby for adoption or have some other sort of connection to adoption. She recently posted a great article today addressed to expectant mothers considering adoption. It is candid, expresses heartache & peace. I have included her post below. Enjoy! Huge hugs mama. I remember being where you are. Researching "adoption", "open adoption", and "birth mothers" until the words ran together. Crying as I read story after story about adoption. I was terrified by some of the stories I read. Screaming into my pillow because I did NOT want to make this choice. I didn't want to make any choice. I just wanted to sleep. I browsed so many agency sites and just looked at families. How was I ever going to choose? I rubbed my stomach and cried. Telling this baby that I loved them and that I was so sorry. I reached out for help on internet groups. Sometimes it was great, sometimes I found the dark underbelly of the adoption world. I went back and forth in my head. I could do this. I couldn't do this. I had to do this. My heart was firm on 'this is your baby, what are you thinking?!?!" Overruling your heart is hard. Telling your heart that love sometimes just isn't enough doesn't always lessen the pain. Sweet mama, you are so loved. Many of the women who came before you are thinking about you. We are praying for your peace. We know what this is like and how hard it is. No one but a birth mother knows this path. This path is hard and it's full of heartbreak, but it's also full of joy and beauty. You learn to love like you've never loved before. You learn what true selflessness is. You put this tiny person ahead of yourself so that they can thrive. You do whatever it takes to make sure that their life is the best it can be. For that, you are an AMAZING MOTHER. Don't let anyone tell you different. Choosing adoption for your child does not take away your "mother status". You are and will always be a mother. If you choose adoption, your child will have two mothers. You will be their birth mother who loved on them while they were growing. You are the mother who created this baby. You gave your body fully over to pregnancy. The heartburn, the insomnia, the throwing up, the *ahem* hemorrhoids. You have loved this baby unconditionally. Even if you don't feel like you are connected to this pregnancy (I wasn't), you love your child. Just by researching your options, you love this child. By choosing the family that you think is best, you love this child. By crying and wishing that you didn't have to make this choice, you love this child. This baby is developing surrounded by so much love. I know you are scared. It's terrifying. There is a reason that "Birth Mom Strong" is a saying. It is hard. You can do it though. If you choose adoption for your child, you WILL make it. The process won't kill you, even if you sometimes think it may. You will not only survive, but you will thrive. Your child will grow up knowing that you loved them fiercely, it's in their very DNA. My heart breaks for you. I am here for you, and so are so many other birth mothers. If you make this decision, we will support you. You will be surrounded by a sisterhood that you never knew existed. These woman have become some of my closest friends. They comfort me when I'm sad, squee over pictures of my son with me, and skype for hours if I need it. They have been in my shoes and understand how I feel. There are things that only a birth mother can really understand. Please, be gentle on yourself. Give yourself grace. Pregnancy is hard enough without adding the stress of an adoption. If you need help, reach out. I am here. Only YOU know what the best decision for this child is. Only you can make that decision.